A regular Nerf gun isn’t for everyone. For some people, a sniper can be the most attractive choice. And since the first Nerf gun was created, people have been asking the question; what’s the best Nerf sniper? If you’re the kind of person that’s tactical and likes to shoot from distance, then a nerf sniper is likely to be a good choice for you. On the other hand, if you’re the type of person that likes to go in all guns blazing, then you should probably consider a regular nerf gun. So, it would seem that their calls for a new sniper were finally answered in 2018 with the release of the Modulus Longstrike. So, lets have a look at a few of the reasons the Longstrike is probably your best option if you’re looking for a sniper. Are Nerf Sniper Rifles any good? The Nerf Longstrike was originally released all the way back in 2010, and back then, we anticipated that we would finally be getting the Nerf Sniper that we’d been craving for years. In my opinion (and many others), the original Longstrike just didn’t live up to expectations. The most common problem with the Longstrike? Quite simply, the range just wasn’t good enough! It was listed as Longstrike (and even sold as ‘the Snipershot’ in Japan), but it just didn’t have the distance necessary for a long range Nerf gun. Fast forward to 2018, and Nerf finally released the long awaited successor to the Longstrike. Whilst it had the exact same exterior and shell as it’s predecessor, there were a few things that they changed about the internals to make it ready for modern day Nerf Wars. Barrel – The Longstrike barrel has a small tactical rail at the front top of the sniper, and a longer tactical rail on the underside of the gun. The Barrel is easily attachable and detachable from the gun itself, so you can actually attach the barrel to other Nerf guns if you want to. It’s long, but this is exactly what we want from a Nerf Sniper. Blaster (Middle) – The Blaster itself continues the abundance of tactical rails, with two further rails on the top of the blaster. This is great if you want to use an additional scope on your Longstrike. It also has a sling attachment point on the underside of the gun too. In between the tactical rails is the access store, which you can easily open. This helps if your gun ever gets jammed (you need to prime the blaster before doing this). Blaster (Side) – On the side of the blaster is the prime, which you can easily pull back to set your shot up. there’s also two unjamming buttons – the top one is used to release the prime handle so you can prime it again and clear out any jams. The bottom button is used if your handle gets jammed. Magazines – Underneath the blaster, you have 3×6 round magazines that give you 6 rounds – much like you’d have in a real sniper. Sights – Unless you’re going to purchase an extra scope to attach to the tactical rails, then the regular model comes with your run of the mill iron sights for accuracy. Handle Grip – The handle of the Longstrike is really what makes it feel realistic. It’s quite long (as you’d expect, but it does enable you to get a good grip and cushion it on your shoulder. There are two attachments on either side for you to store extra magazines. The Modulus Longstrike Scope is exactly the same as the other scope from Modulus, except it’s painted differently. It’s easy to attach to your tactical rail, and although it isn’t the most practical, it definitely looks super cool. The other attachment that comes with the Longstrike is a bipod. This is great for if you want to have some fun firing in the prone position. There are definitely some good things about the Longstrike, but there are some bad things about the Longstrike too. Doesn’t get jammed – In comparison to the original Longstrike, it undoubtedly doesn’t get jammed anywhere near as frequently. Of course, it does sometimes – but that’s really any Nerf gun. Feels and looks great – Aesthetically, the Longstrike is undoubtedly one of Nerfs best guns. It has the look and feel of a real sniper, which is pretty much what any Nerf fan wants. Good customer service – Although you’re not going to get the 100 foot accuracy that every user wants, you do get a good accuracy up to around 40 feet. This is actually about average for most Nerf guns, but you can’t expect any more than that from foam bullets. Scope improvements – Compared to the old scope that came with the original Longstrike, this is a definite improvement in terms of quality. It’s really expensive – The one thing about the Longstrike that I don’t like – well, no one really likes, is that it’s a little expensive. It’s more than double the price of the original Longstrike, which is a bit much in my opinion. They easily could’ve just up the price a little. But, you are getting a decent amount of blaster for your money, so it’s really up to you. 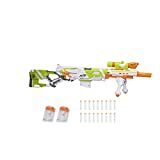 Not much better than other Nerf guns – Aside from the super cool way that the Longstrike looks, it’s really not much of a step up on other Nerf guns in terms of range and accuracy. It’s more of a showpiece than a practical sniper. 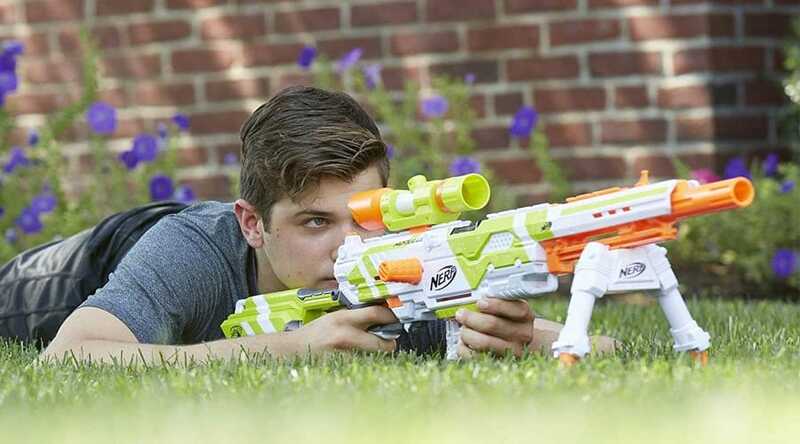 The Modulus is designed to look cool, but it’s still a practical Nerf gun to take to war. Is it as good as other long range snipers? Well, let’s have a look at some of the other Long Range Nerf Guns out there. The Longshot CS-6 was originally released all the way back in 2004. Of course, you’re really going to struggle to get your hands on that one nowadays. However, you can still find the updated version, the Zombie Strike CS-12. This was made exclusively for Target, so that’s the only place you’re going to find it. It’s undoubtedly as good as the Longstrike in terms of appearance – that is, if you’re a fan of the Zombie Strike series in general. They’ve released various different Longshot blasters, so it’s worth checking out the ones that you could get your hands on. The Nerf Centurion is undoubtedly one of the most unpredictable Nerf guns out there. But if we’re talking about pulling off long shots, then it’s really difficult to beat the Centurion. You can pull off some pretty awesome long shits with this one, largely due to it’s high amount of firepower. The reality is that a Nerf Sniper is still a Nerf. That means you’re firing foam – so you’re never going to take someone down 200 feet away. Nerf Snipers are generally more for show than anything else, and they don’t have much more range than regular Nerf guns (which is why I recommended the Centurion). Overall, the Longstrike is undoubtedly one of the coolest looking Nerf guns that they’ve released, and it’s satified the appetite of every Nerf fan who’s wanted a cool Nerf sniper since.. well, the last Longstrike was released. However, there are a ton of other Nerf guns, melee weapons for close combat and other Nerf products that you might want to consider as well. But all in all, the Longstrike is the best sniper that Nerf have released as of yet.